A market is one of the many varieties of systems, institutions, procedures, social relations and infrastructures whereby parties engage in exchange. While parties may exchange goods and services by barter, most markets rely on sellers offering their goods or services (including labor) in exchange for money from buyers. It can be said that a market is the process by which the prices of goods and services are established. Markets facilitate trade and enable the distribution and allocation of resources in a society. Markets allow any trade-able item to be evaluated and priced. A market emerges more or less spontaneously or may be constructed deliberately by human interaction in order to enable the exchange of rights (cf. ownership) of services and goods. 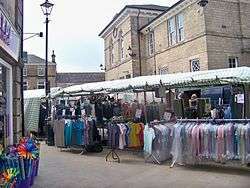 Markets generally supplant gift economies and are often held in place through rules and customs, such as a booth fee, competitive pricing, and source of goods for sale (local produce or stock registration). Markets can differ by products (goods, services) or factors (labour and capital) sold, product differentiation, place in which exchanges are carried, buyers targeted, duration, selling process, government regulation, taxes, subsidies, minimum wages, price ceilings, legality of exchange, liquidity, intensity of speculation, size, concentration, exchange asymmetry, relative prices, volatility and geographic extension. The geographic boundaries of a market may vary considerably, for example the food market in a single building, the real estate market in a local city, the consumer market in an entire country, or the economy of an international trade bloc where the same rules apply throughout. Markets can also be worldwide, for example the global diamond trade. 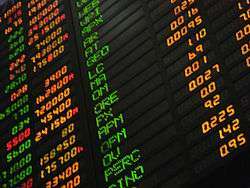 National economies can be classified, for example as developed markets or developing markets. In mainstream economics, the concept of a market is any structure that allows buyers and sellers to exchange any type of goods, services and information. The exchange of goods or services, with or without money, is a transaction. Market participants consist of all the buyers and sellers of a good who influence its price, which is a major topic of study of economics and has given rise to several theories and models concerning the basic market forces of supply and demand. A major topic of debate is how much a given market can be considered to be a "free market", that is free from government intervention. Microeconomics traditionally focuses on the study of market structure and the efficiency of market equilibrium, when the latter (if it exists) is not efficient, then economists say that a market failure has occurred. However it is not always clear how the allocation of resources can be improved since there is always the possibility of government failure. A market is one of the many varieties of systems, institutions, procedures, social relations and infrastructures whereby parties engage in exchange. While parties may exchange goods and services by barter, most markets rely on sellers offering their goods or services (including labor) in exchange for money from buyers. 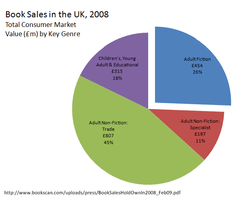 It can be said that a market is the process by which the prices of goods and services are established. Markets facilitate trade and enables the distribution and allocation of resources in a society. Markets allow any trade-able item to be evaluated and priced. A market emerges more or less spontaneously or may be constructed deliberately by human interaction in order to enable the exchange of rights (cf. ownership) of services and goods. Markets of varying types can spontaneously arise whenever a party has interest in a good or service that some other party can provide. Hence there can be a market for cigarettes in correctional facilities, another for chewing gum in a playground, and yet another for contracts for the future delivery of a commodity. There can be black markets, where a good is exchanged illegally, for example markets for goods under a command economy despite pressure to repress them, and virtual markets, such as eBay, in which buyers and sellers do not physically interact during negotiation. A market can be organized as an auction, as a private electronic market, as a commodity wholesale market, as a shopping center, as a complex institution such as a stock market, and as an informal discussion between two individuals. prediction markets are a type of speculative market in which the goods exchanged are futures on the occurrence of certain events. They apply the market dynamics to facilitate information aggregation. 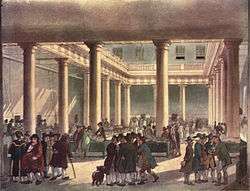 Corn Exchange, in London circa 1809. A market in Râmnicu Vâlcea by Amedeo Preziosi. 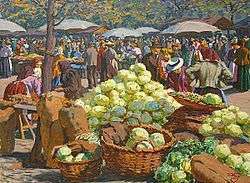 Cabbage market by Václav Malý. In economics, a market that runs under laissez-faire policies is called a free market, it is "free" from the government, in the sense that the government makes no attempt to intervene through taxes, subsidies, minimum wages, price ceilings, etc. 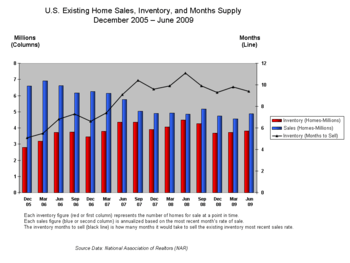 However, market prices may be distorted by a seller or sellers with monopoly power, or a buyer with monopsony power. Such price distortions can have an adverse effect on market participant's welfare and reduce the efficiency of market outcomes. Also, the relative level of organization and negotiating power of buyers and sellers markedly affects the functioning of the market. There exists a popular thought, especially among economists, that free markets would have a structure of a perfect competition. The logic behind this thought is that market failures are thought to be caused by other exogenic systems, and after removing those exogenic systems ("freeing" the markets) the free markets could run without market failures. For a market to be competitive, there must be more than a single buyer or seller. It has been suggested that two people may trade, but it takes at least three persons to have a market, so that there is competition in at least one of its two sides. However, competitive markets, as understood in formal economic theory, rely on much larger numbers of both buyers and sellers. A market with a single seller and multiple buyers is a monopoly. A market with a single buyer and multiple sellers is a monopsony. These are "the polar opposites of perfect competition". As an argument against such a logic there is a second view that suggests that the source of market failures is inside the market system itself, therefore the removal of other interfering systems would not result in markets with a structure of perfect competition. As an analogy, such an argument may suggest that capitalists don't want to enhance the structure of markets, just like a coach of a football team would influence the referees or would break the rules if he could while he is pursuing his target of winning the game. Thus according to this view, capitalists are not enhancing the balance of their team versus the team of consumer-workers, so the market system needs a "referee" from outside that balances the game. In this second framework, the role of a "referee" of the market system is usually to be given to a democratic government. 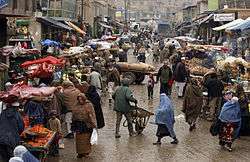 An Afghan market teeming with vendors and shoppers. Monday market in Portovenere, Italy. 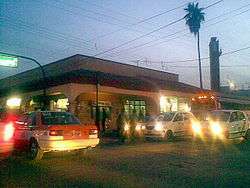 Gómez Palacio city's municipal market. Works Project Administration poster (1937). "the market" denotes the abstract mechanisms whereby supply and demand confront each other and deals are made. In its place, reference to markets reflects ordinary experience and the places, processes and institutions in which exchanges occurs. Microeconomics (from Greek prefix mikro- meaning "small" and economics) is a branch of economics that studies the behavior of individuals and small impacting organizations in making decisions on the allocation of limited resources (see scarcity). Macroeconomics (from the Greek prefix makro- meaning "large" and economics), on the other hand, is a branch of economics dealing with the performance, structure, behavior, and decision-making of an economy as a whole, rather than individual markets. The modern field of microeconomics arose as an effort of neoclassical economics school of thought to put economic ideas into mathematical mode. It began in the 19th century debates surrounding the works of Antoine Augustine Cournot, William Stanley Jevons, Carl Menger, Léon Walras, this period is usually denominated as the Marginal Revolution . A recurring theme of these debates was the contrast between the Labor theory of value and the Subjective theory of value, the former being associated with classical economists such as Adam Smith, David Ricardo and Karl Marx (Marx was a contemporary of the marginalists). Alfred Marshall in his Principles of Economics (1890), presented a possible solution to this problem, using the supply and demand model. Marshall's idea of solving the controversy was that the demand curve could be derived by aggregating individual consumer demand curves, which were themselves based on the consumer problem of maximizing utility. The supply curve could be derived by superimposing a representative firm supply curves for the factors of production and then market equilibrium would be given by the intersection of demand and supply curves. He also introduced the notion of different market periods: mainly short run and long run. This set of ideas gave way to what economists call perfect competition, now found in the standard microeconomics texts, even though Marshall himself has highly skeptical it could be used as general model of all markets. 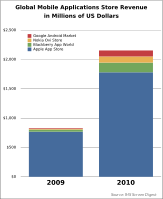 Oligopoly is a market form in which a market or industry is dominated by a small number of sellers. The oldest model was the duopoly of Cournot (1838). It was criticized by Harold Hotelling for its instability, by Joseph Bertrand for lacking equilibrium for prices as independent variables. Hotelling built a model of market located over a line with two sellers in each extreme of the line, in this case maximizing profit for both sellers leads to a stable equilibrium. From this model also follows that if a seller is to choose the location of his store so as to maximize his profit, he will place his store the closest to his competitor: "the sharper competition with his rival is offset by the greater number of buyers he has an advantage". He also argues that clustering of stores is wasteful from the point of view of transportation costs and that public interest would dictate more spatial dispersion. Monopolistic competition is a type of imperfect competition such that many producers sell products that are differentiated from one another (e.g. by branding or quality) and hence are not perfect substitutes. In monopolistic competition, a firm takes the prices charged by its rivals as given and ignores the impact of its own prices on the prices of other firms. The "founding father" of the theory of monopolistic competition is Edward Hastings Chamberlin, who wrote a pioneering book on the subject, Theory of Monopolistic Competition (1933). Joan Robinson published a book The Economics of Imperfect Competition with a comparable theme of distinguishing perfect from imperfect competition. Chamberlin defined monopolistic competition as, "...challenge to traditional viewpoint of economics that competition and monopoly are alternatives and that individual prices are to be explained in terms of one or the other." He continues, "By contrast it is held that most economic situations are composite of both competition and monopoly, and that, wherever this is the case, a false view is given by neglecting either one of the two forces and regarding the situation as made up entirely of the other." William Baumol provided in his 1977 paper the current formal definition of a natural monopoly where “an industry in which multiform production is more costly than production by a monopoly”. Baumol defined a contestable market in his 1982 paper as a market where "entry is absolutely free and exit absolutely costless", freedom of entry in Stigler sense: the incumbent has no cost discrimination against entrants. He states that a contestable market will never have an economic profit greater than zero when in equilibrium and the equilibrium will also be efficient. According to Baumol this equilibrium emerges endogenously due to the nature of contestable markets, that is the only industry structure that survives in the long run is the one which minimizes total costs. This is in contrast to the older theory of industry structure since not only industry structure is not exogenously given, but equilibrium is reached without add hoc hypothesis on the behavior of firms, say using reaction functions in a duopoly. He concludes the paper commenting that regulators that seek to impede entry and/or exit of firms would do better to not interfere if the market in question resembles a contestable market. Used cars market: due to presence of fundamental asymmetrical information between seller and buyer the market equilibrium is not efficient; in the language of economists it is a market failure. Around the 1970s the study of market failures came into focus with the study of information asymmetry. In particular three authors emerged from this period: Akerlof, Spence, and Stiglitz. Akerlof considered the problem of bad quality cars driving good quality cars out of the market in his classic “The Market for Lemons” (1970) because of the presence of asymmetrical information between buyers and sellers. Michael Spence explained that signaling was fundamental in the labour market, because since employers can't know beforehand which candidate is the most productive, a college degree becomes a signaling device that a firm uses to select new personnel. C. B. Macpherson identifies an underlying model of the market underlying Anglo-American liberal-democratic political economy and philosophy in the seventeenth and eighteenth centuries: persons are cast as self-interested individuals, who enter into contractual relations with other such individuals, concerning the exchange of goods or personal capacities cast as commodities, with the motive of maximizing pecuniary interest. The state and its governance systems are cast as outside of this framework. This model came to dominant economic thinking in the later nineteenth century, as economists such as Ricardo, Mill, Jevons, Walras and later neo-classical economics shifted from reference to geographically located marketplaces to an abstract "market". This tradition is continued in contemporary neoliberalism, where the market is held up as optimal for wealth creation and human freedom, and the states' role imagined as minimal, reduced to that of upholding and keeping stable property rights, contract, and money supply. According to David Harvey, this allowed for boilerplate economic and institutional restructuring under structural adjustment and post-Communist reconstruction. Similar formalism occurs in a wide variety of social democratic and Marxist discourses that situate political action as antagonistic to the market. In particular, commodification theorists such as Georg Lukács insist that market relations necessarily lead to undue exploitation of labour and so need to be opposed in toto. A coal power plant in Datteln. 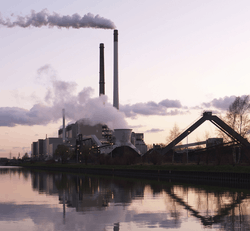 Emissions trading or cap and trade is a market-based approach used to control pollution by providing economic incentives for achieving reductions in the emissions of pollutants. A central theme of empirical analyses is the variation and proliferation of types of markets since the rise of capitalism and global scale economies. The Regulation school stresses the ways in which developed capitalist countries have implemented varying degrees and types of environmental, economic, and social regulation, taxation and public spending, fiscal policy and government provisioning of goods, all of which have transformed markets in uneven and geographical varied ways and created a variety of mixed economies. Drawing on concepts of institutional variance and path dependence, varieties of capitalism theorists (such as Peter Hall and David Soskice) identify two dominant modes of economic ordering in the developed capitalist countries, "coordinated market economies" such as Germany and Japan, and an Anglo-American "liberal market economies". However, such approaches imply that the Anglo-American liberal market economies, in fact, operate in a matter close to the abstract notion of "the market". While Anglo-American countries have seen increasing introduction of neo-liberal forms of economic ordering, this has not led to simple convergence, but rather a variety of hybrid institutional orderings. Rather, a variety of new markets have emerged, such as for carbon trading or rights to pollute. In some cases, such as emerging markets for water, different forms of privatization of different aspects of previously state run infrastructure have created hybrid private-public formations and graded degrees of commodification, commercialization, and privatization. 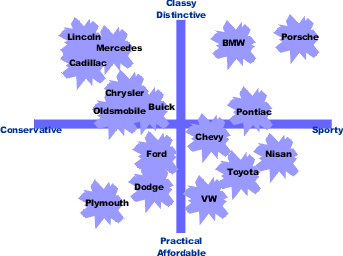 Perceptual mapping is a diagrammatic technique used by marketers that attempts to visually display the perceptions of customers or potential customers. Typically the position of a product, product line, brand, or company is displayed relative to their competition. The marketing management school, evolved in the late 1950s and early 1960s, is fundamentally linked with the marketing mix framework, a business tool used in marketing and by marketers. In his paper "The Concept of the Marketing Mix", Neil Borden reconstructed the history of the term "marketing mix". He started teaching the term after an associate, James Culliton, described the role of the marketing manager in 1948 as a "mixer of ingredients"; one who sometimes follows recipes prepared by others, sometimes prepares his own recipe as he goes along, sometimes adapts a recipe from immediately available ingredients, and at other times invents new ingredients no one else has tried. The marketer E. Jerome McCarthy proposed a four Ps classification (Product, Price, Promotion, Place) in 1960, which has since been used by marketers throughout the world. Robert F. Lauterborn proposed a four Cs classification (Consumer, Price, Promotion, Place) in 1990 which is a more consumer-oriented version of the four Ps that attempts to better fit the movement from mass marketing to niche marketing. Koichi Shimizu proposed a 7Cs Compass Model (corporation, commodity, cost, communication, channel, consumer, circumstances) to provide a more complete picture of the nature of marketing in 1981. A prominent entry-point for challenging the market model's applicability concerns exchange transactions and the homo economicus assumption of self-interest maximization. As of 2012 a number of streams of economic sociological analysis of markets focus on the role of the social in transactions, and on the ways transactions involve social networks and relations of trust, cooperation and other bonds. Economic geographers in turn draw attention to the ways exchange transactions occur against the backdrop of institutional, social and geographic processes, including class relations, uneven development, and historically contingent path-dependencies. Pierre Bourdieu has suggested the market model is becoming self-realizing, in virtue of its wide acceptance in national and international institutions through the 1990s. Trade networks are very old, in this picture the blue line shows the trade network of the Radhanites, c. 870 CE. Michel Callon's concept of framing provides a useful schema: each economic act or transaction occurs against, incorporates and also re-performs a geographically and cultural specific complex of social histories, institutional arrangements, rules and connections. These network relations are simultaneously bracketed, so that persons and transactions may be disentangled from thick social bonds. The character of calculability is imposed upon agents as they come to work in markets and are “formatted” as calculative agencies. Market exchanges contain a history of struggle and contestation that produced actors predisposed to exchange under certain sets of rules. Therefore, for Challon, market transactions can never be disembedded from social and geographic relations and there is no sense to talking of degrees of embeddedness and disembeddeness. An emerging theme is the interrelationship, inter-penetrability and variations of concepts of persons, commodities, and modes of exchange under particular market formations. This is most pronounced in recent movement towards post-structuralist theorizing that draws on Michel Foucault and Actor Network Theory and stress relational aspects of person-hood, and dependence and integration into networks and practical systems. Commodity network approaches further both deconstruct and show alternatives to the market models concept of commodities. In social systems theory (cf. Niklas Luhmann), markets are also conceptualized as inner environments of the economy. As horizon of all potential investment decisions the market represents the environment of the actually realized investment decisions. Such inner environments, however, can also be observed in further function systems of society like in political, scientific, religious or mass media systems. A widespread trend in economic history and sociology is skeptical of the idea that it is possible to develop a theory to capture an essence or unifying thread to markets. For economic geographers, reference to regional, local, or commodity specific markets can serve to undermine assumptions of global integration, and highlight geographic variations in the structures, institutions, histories, path dependencies, forms of interaction and modes of self-understanding of agents in different spheres of market exchange. Reference to actual markets can show capitalism not as a totalizing force or completely encompassing mode of economic activity, but rather as "a set of economic practices scattered over a landscape, rather than a systemic concentration of power". 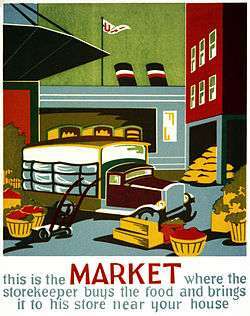 Problematic for market formalism is the relationship between formal capitalist economic processes and a variety of alternative forms, ranging from semi-feudal and peasant economies widely operative in many developing economies, to informal markets, barter systems, worker cooperatives, or illegal trades that occur in most developed countries. Practices of incorporation of non-Western peoples into global markets in the nineteenth and twentieth century did not merely result in the quashing of former social economic institutions. Rather, various modes of articulation arose between transformed and hybridized local traditions and social practices and the emergent world economy. So called capitalist markets, by their liberal nature, have almost always included a wide range of geographically situated economic practices that do not follow the market model. Economies are thus hybrids of market and non-market elements. Black market in La Paz. Helpful here is J. K. Gibson-Graham's complex topology of the diversity of contemporary market economies describing different types of transactions, labour, and economic agents. Transactions can occur in underground markets (such as for marijuana) or be artificially protected (such as for patents). They can cover the sale of public goods under privatization schemes to co-operative exchanges and occur under varying degrees of monopoly power and state regulation. Likewise, there are a wide variety of economic agents, which engage in different types of transactions on different terms: one cannot assume the practices of a religious kindergarten, multinational corporation, state enterprise, or community-based cooperative can be subsumed under the same logic of calculability. This emphasis on proliferation can also be contrasted with continuing scholarly attempts to show underlying cohesive and structural similarities to different markets. Gibson-Graham thus read a variety of alternative markets, for fair trade and organic foods, or those using Local Exchange Trading Systems as not only contributing to proliferation, but also forging new modes of ethical exchange and economic subjectivities. A Kula bracelet from the Trobriand Islands. 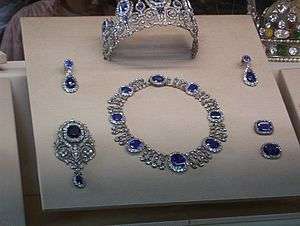 French crown jewels in the Louvre exhibition. Its origins as a sub-field of anthropology begin with the Polish-British founder of anthropology, Bronislaw Malinowski, and his French compatriot, Marcel Mauss, on the nature of gift-giving exchange (or reciprocity) as an alternative to market exchange. Studies in Economic Anthropology for the most part are focused on exchange. Bronislaw Malinowski's path-breaking work, Argonauts of the Western Pacific (1922), addressed the question, "why would men risk life and limb to travel across huge expanses of dangerous ocean to give away what appear to be worthless trinkets?". Malinowski carefully traced the network of exchanges of bracelets and necklaces across the Trobriand Islands, and established that they were part of a system of exchange (the Kula ring). He stated that this exchange system was clearly linked to political authority. In the 1920s and later, Malinowski's study became the subject of debate with the French anthropologist, Marcel Mauss, author of The Gift (Essai sur le don, 1925). Malinowski emphasized the exchange of goods between individuals, and their non-altruistic motives for giving: they expected a return of equal or greater value (colloquially referred to as "Indian giving"). In other words, reciprocity is an implicit part of gifting; no "free gift" is given without expectation of reciprocity. Mauss, in contrast, has emphasized that the gifts were not between individuals, but between representatives of larger collectivities. These gifts were, he argued, a "total prestation." They were not simple, alienable commodities to be bought and sold, but, like the "Crown jewels", embodied the reputation, history and sense of identity of a "corporate kin group," such as a line of kings. Given the stakes, Mauss asked "why anyone would give them away?" His answer was an enigmatic concept, "the spirit of the gift." A good part of the confusion (and resulting debate) was due to a bad translation. Mauss appeared to be arguing that a return gift is given to keep the very relationship between givers alive; a failure to return a gift ends the relationship and the promise of any future gifts. Based on an improved translate, Jonathan Parry has demonstrated that Mauss was arguing that the concept of a "pure gift" given altruistically only emerges in societies with a well-developed market ideology. Rather than emphasize how particular kinds of objects are either gifts or commodities to be traded in restricted spheres of exchange, Arjun Appadurai and others began to look at how objects flowed between these spheres of exchange. They shifted attention away from the character of the human relationships formed through exchange, and placed it on "the social life of things" instead. They examined the strategies by which an object could be "singularized" (made unique, special, one-of-a-kind) and so withdrawn from the market. A marriage ceremony that transforms a purchased ring into an irreplaceable family heirloom is one example; the heirloom, in turn, makes a perfect gift. Market size can be given in terms of the number of buyers and sellers in a particular market or in terms of the total exchange of money in the market, generally annually (per year). When given in terms of money, market size is often termed market value, but in a sense distinct from market value of individual products. For one and the same goods, there may be different (and generally increasing) market values at the production level, the wholesale level and the retail level. For example, the value of the global illicit drug market for the year 2003 was estimated by the United Nations to be US$13 billion at the production level, $94 billion at the wholesale level (taking seizures into account), and US$322 billion at the retail level (based on retail prices and taking seizures and other losses into account). ↑ Oxford Dictionaries . Retrieved 25 October 2014. ↑ Heyne, Paul; Boettke, Peter J.; Prychitko, David L. (2014). The Economic Way of Thinking (13th ed.). Pearson. pp. 130–132. ISBN 978-0-13-299129-2. ↑ Sullivan, arthur; Steven M. Sheffrin (2003). Economics: Principles in action. Upper Saddle River, New Jersey 07458: Pearson Prentice Hall. p. 28. ISBN 0-13-063085-3. ↑ Callon, M. (1998) "Introduction: The Embeddedness of Economic Markets in Economics." In The Laws of the Markets, edited by Michel Callon. Basic Blackwell/The Sociological Review pp. 1–57 1998, p.2). ↑ Hotteling, H. (1929). "Stability in Competition". The Economic Journal. 39 (153): 41–57. JSTOR 2224214. ↑ Chamberlin, E. H. (1937). "Monopolistic or Imperfect Competition?". The Quarterly Journal of Economics. 51 (4): 557–580. doi:10.2307/1881679. ↑ Baumol, William J. (1977). "On the Proper Cost Tests for Natural Monopoly in a Multiproduct Industry". American Economic Review. 67 (5): 809–822. JSTOR 1828065. ↑ Akerlof, George A. (1970). 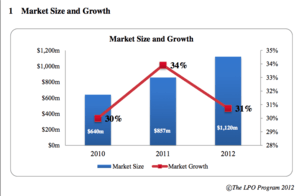 "The Market for 'Lemons': Quality Uncertainty and the Market Mechanism". Quarterly Journal of Economics. 84 (3): 488–500. doi:10.2307/1879431. ↑ Spence, A. M. (1973). "Job Market Signaling". Quarterly Journal of Economics. 87 (3): 355–374. doi:10.2307/1882010. JSTOR 1882010. ↑ Harvey, David (2005) A Short History of Neoliberalism Oxford University Press. ↑ Borden, Neil. "The Concept of the Marketing Mix" (PDF). Suman Thapa. Retrieved 24 April 2013. ↑ Borden, Neil H. (1965). "The Concept of the Marketing Mix". In Schwartz, George. Science in marketing. Wiley marketing series. Wiley. p. 286ff. Retrieved 2013-11-04. ↑ Needham, Dave (1996). Business for Higher Awards. Oxford, England: Heinemann. ↑ Lauterborn, B. (1990). New Marketing Litany: Four Ps Passé: C-Words Take Over. Advertising Age, 61(41), 26. ↑ (cf. Roth 2012) "Leaving commonplaces on the commonplace. Cornerstones of a polyphonic market theory", Journal for Critical Organization Inquiry, Vol. 10 No. 3, pp. 43–52. ↑ Peck, J. (2005) "Economic Geographies in Space" Economic Geography 81(2) 129-175. ↑ (Gibson-Graham, J.K. (2006) Postcapitalist Politics. University of Minnesota Press,. p. 2). 1 2 Parry, Jonathan (1986). "The Gift, the Indian Gift and the 'Indian Gift'". Man. 21 (3): 453–73. doi:10.2307/2803096. ↑ Mauss, Marcel (1970). The Gift: Forms and Functions of Exchange in Archaic Societies. London: Cohen & West. ↑ United Nations, "2005 World Drug Report," Office on Drugs and Crime, June 2005, pg. 16. Frank, Robert H., Microeconomics and Behavior, McGraw-Hill/Irwin, 6th Edition: 2006. Roberts, Russell (September 5, 2005). "The Reality of Markets". Library of Economics and Liberty. Bauer, Leonard & Matis, Herbert (1988) From moral to political economy: The Genesis of social sciences, History of European Ideas 9 (2), 125-143. Nathaus, Klaus & David Gilgen (Eds. ): Change of Markets and Market Societies: Concepts and Case Studies. Historical Social Research 36 (3), Special Issue, 2011.